Well, its a new year and it’s time to catch up on sharing all our projects around the house and adventures over the past few months. I had great intentions of posting regularly a few months ago, but my day job and mom job did not make it possible. Despite my lack of action, Ryan has been super busy starting the process to update our kitchen to suit our style and “foodee” way of life. We knew moving in to the house over a year ago that the kitchen was going to be a huge limitation on daily life, but also an opportunity to improve the house and make it our own. Our vision for the “new” kitchen looks a bit like this: We have a larger and more high quality fridge that we brought with us from our previous home that will fit perfectly in between the windows on the left of the photo. 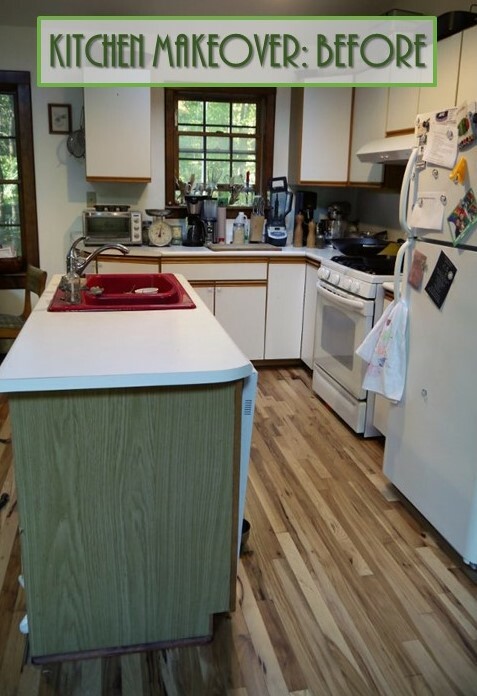 There is room to expand the kitchen island, while still fitting a kitchen table next to it. We are also talking about a pot rack over the island, but I want task lighting over the island too – so we need to reconcile these two ideas. Needless to say the design is a work in progress, but that won’t stop us from diving in. So, where to begin! The red sink was a hit with guests due to how unique it is, but not very practical for our purposes. It has two basins, and they just did not seem like an efficient use of the space. I think that stainless two-basin sinks have more capacity than these due to the thickness and mold of the cast iron. This was getting really old while washing a large high chair tray several times a day. The next major issue was the pile of recycling that kept accumulating on the floor next to the trash can. Another issue with the little guy once he started crawling – and just simply too much clutter. Apparently we generate a lot of recycling – luckily our local transfer station takes single stream! 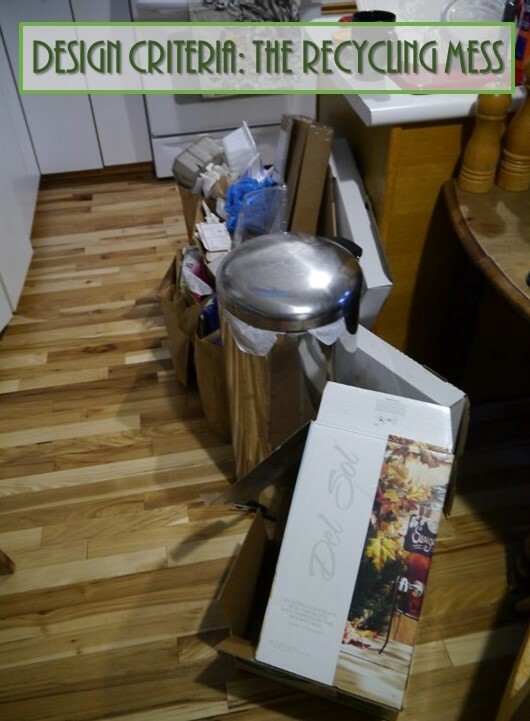 Here is a photo of the offensive pile at its worst: These two issues can be remedied by beginning work on the kitchen island, so that is where we have started. To commence work on the island, we have to make some considerable decisions about style and materials. We have determined at this point, that we will be pouring concrete counter tops using a concrete specifically for that purpose. We have also selected maple as our wood of choice in regards to the cabinet doors/island material. All of this is handmade by my favorite handyman. I can’t wait to share the island with you, which is currently underway, we just a have a few finishing touches before it is blog ready. 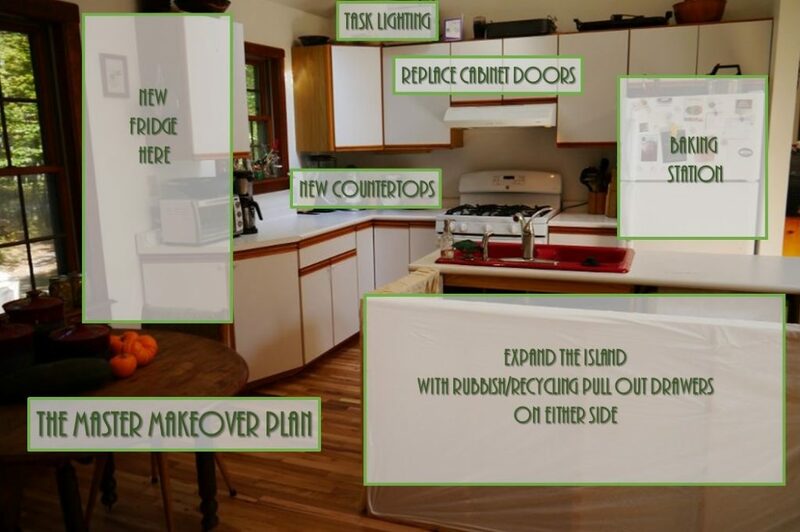 This entry was posted in Building Things and tagged diy, kitchen, makeover, remodel by beettheratrace. Bookmark the permalink. The new island is going to be awesome, and so helpful! Personally, I would replace all upper cabinets with tile back splash and open shelving (white subway can be v affordable, use dark grout and then it is low maintenance too). However, it is difficult for me to express how much I hate upper cabinets using polite language. I wonder if the sink used to be under the window? Copyright © 2019 Beet the Rat Race All Rights Reserved.